INISHOWEN long-serving Donegal Civil Defence member Paidin Doherty joined colleagues to participate in the major State ceremony on O'Connell Street to commemorate 1916 Easter Rising. Paidin from Clonmany who has 27 years service to the voluntary organisation joined Ian Gallagher from Laghey (five years' service) and Donal Bonner from Stranorlar (two years' service) to represent the Donegal Civil Defence at the prestigious ceremony. Donegal Civil Defence representatives pictured at Arbour Hill, Dublin, prior to the Easter 1916 Commemoration Parade. From left, Donal Bonner, Paidin Doherty and Ian Gallagher. The volunteers had taken part in foot drill training, one day a week every fortnight at McKee Barracks since last November in preparation for the event. 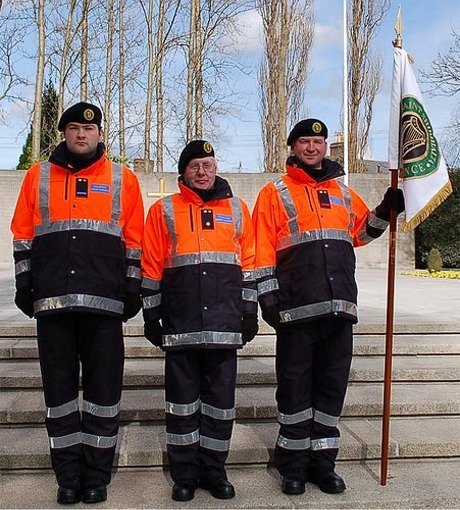 The Irish Civil Defence is a volunteer-led organisation which supports the front line emergency services. Meanwhile, locally on Monday, March 28, the Donegal Civil Defence participated in the Carndonagh Cross Community Easter Parade. Sixteen Civil Defence volunteers led the parade and took part in the official ceremonies which included a wreath-laying ceremony and the reading of the Proclamation to commemorate the centenary.